Monitoring changes in glaciers and snow in the greater Himalayan region has become vital for improving the understanding of climate signals and the contribution of snow and glacier melt to runoff in different river basins in the region. Given the expanding interest and demand for cryosphere monitoring research, the Cryosphere Monitoring Project (CMP) was initiated with support from the Ministry of Foreign Affairs, Norway. In addition to undertaking activities to monitor and assess changes in glaciers, snow, and glacio-hydrology in the Hindu Kush Himalayas, the CMP also has a special focus on strengthening the capacity of Nepalese partner organizations. 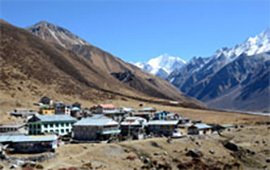 As a part of the CMP, ICIMOD organized a research and training expedition to Yala Glacier in the Langtang Valley of Nepal from 26 October to 10 November 2012. During the expedition, students of the Masters in Research in Glaciology programme at Kathmandu University and participants from partner institutions were trained on taking glacier mass balance measurements, meteorological measurements, and hydrological measurements and surveying. The data collected during the expedition will feed into on-going research for the CMP. 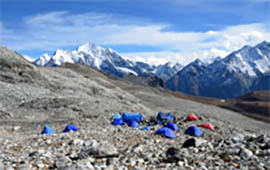 The core expedition team consisted of 16 members from ICIMOD; Kathmandu University; Tribhuvan University; Department of Hydrology and Meteorology, Government of Nepal; Water and Energy Commission Secretariat, Government of Nepal; Austria-based Central Institution for Meteorology and Geodynamics (ZAMG); Institute of Tibetan Plateau Research, Chinese Academy of Sciences (CAS); and an International Federation of Mountain Guides Associations-certified mountain guide from Nepal National Mountain Guide Association. 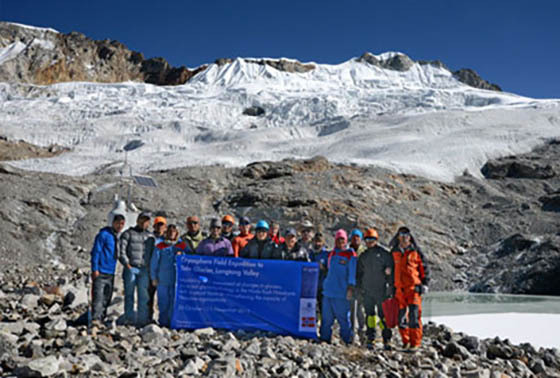 The Trekking agency ‘Guides for All Seasons (GFAS)’ facilitated the expedition with trekking and camping logistics and also supported the measurements on the glacier. Prior to the expedition, a theoretical training on glacier mass balance monitoring was conducted by Dr Dorothea Stumm, Glaciologist at ICIMOD and leader of the expedition, and Sharad Joshi, Research Associate for the Integrated Water and Hazard Management programme at ICIMOD, at the ICIMOD headquarters. 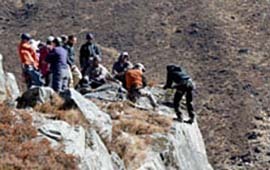 Participants were also briefed on possible health risks at high altitudes and were introduced to the basics of mountaineering, including roping and knotting techniques, and the use of the Gamow bag, oxygen mask. Throughout the expedition, members were given practical training on mountaineering skills, such as rope handling, building anchors on rock and snow, recognizing and avoiding crevasses, and rescue systems used to retrieve people from crevasses. 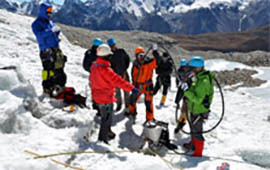 While on the glacier, the participants gained hands-on experience in different measurement techniques to complement theoretical knowledge and prepare them to perform scientific measurements in extreme mountain climate and terrains. Activities included the maintenance of a network of mass balance stakes on the glacier. Participants also practised snow measurement techniques (e.g., snow depth and density measurements in snow pits) at different altitudes on the glacier. Geodetic measurements techniques and the use of surveying equipment, such as GPS and Total Station were also shared with the participants. 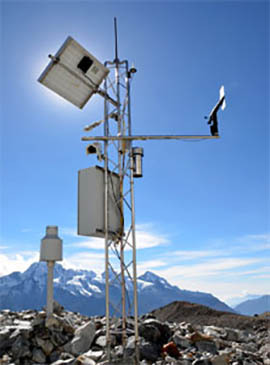 Automatic weather stations in Kyangjing and at the Yala Glacier base camp were maintained, and the data they had collected was downloaded. 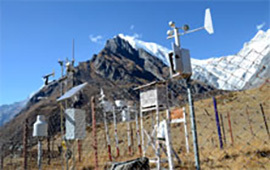 Preliminary daily meteorological data from the station at the Yala Glacier base camp can be accessed on the Cryosphere Knowledge Hub website. 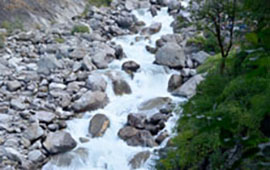 Hydrological discharge measurements were taken in Langtang River and at the outlet stream of Lirung Glacier. Dr Stumm observed a negative mass balance on the Yala Glacier for the past year (October 2011–November 2012). “Most likely in the past year, large parts of the glacier area experienced ice loss, which could be caused by increased glacier melt and/or less snow accumulation”, she said. As an immediate consequence, the glacier surface has wasted down. She pointed out the need for better topographic maps of the area and added that “to provide better results for the entire glacier, first all the measurements have to be analysed thoroughly”. She stressed the need for enhanced understanding of the complex processes and timing of snow accumulation and compaction and melt and how these contribute to the net mass balance of the glacier as well as resulting impacts on runoff. Sanjay Gurung, a student from Kathmandu University, shared that in spite of the challenges and risks involved in this kind of work, the expedition provided him with a valuable hands-on learning opportunity to supplement knowledge gained in the classroom. “The students had information sharing sessions every evening to discuss what we observed throughout the day. In the earlier part of the trek these sessions were very useful, and the comments and feedback from the experts were very encouraging”, he added. Students and project partners learning basic mountaineering techniques from a certified mountain guide in Kyangjing. Participants learning how to use a steam ice drill to install measurement stakes in the glacier.